Between the stacks: jazz from Vinnie Rodriguez Quartet. On the books: Eric Shifrin and the In Crowd. It all began with jazz musicians perusing the used disks at Bird & Beckett Books and Records, a typically compact bookshop in San Francisco's Glen Park neighborhood, itself a compact place with a small-town, European feel. 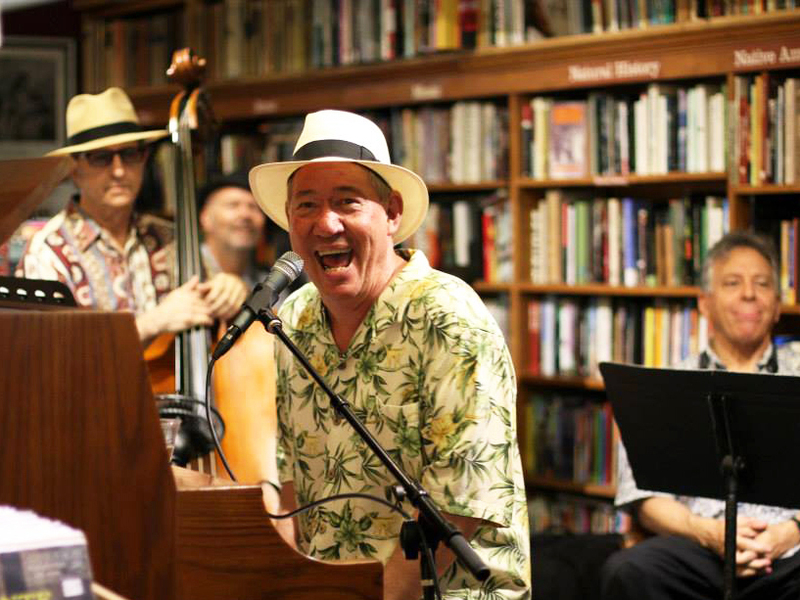 Soon the bookshop was hosting jazz performances, and by 2002 it was doing so regularly, becoming one of the few bookstores anywhere—or anywhere we know—that regularly serves as a concert hall. "It's just because I like the music and wanted to support the musicians," says owner Eric Whittington. "And it draws people into the store." And, no, Eric doesn't know other bookstores that do what he does with the music. "I think we're kind of doing that uniquely," he says. The shop, named for the bebop saxophone innovator and the Irish novelist-playwright, is at 653 Chenery Street, two blocks from the Glen Park BART Station, a nice if rough-hewn example of mid-century modern architecture. Concerts are as often as several times a week, starting late afternoons, early evenings. 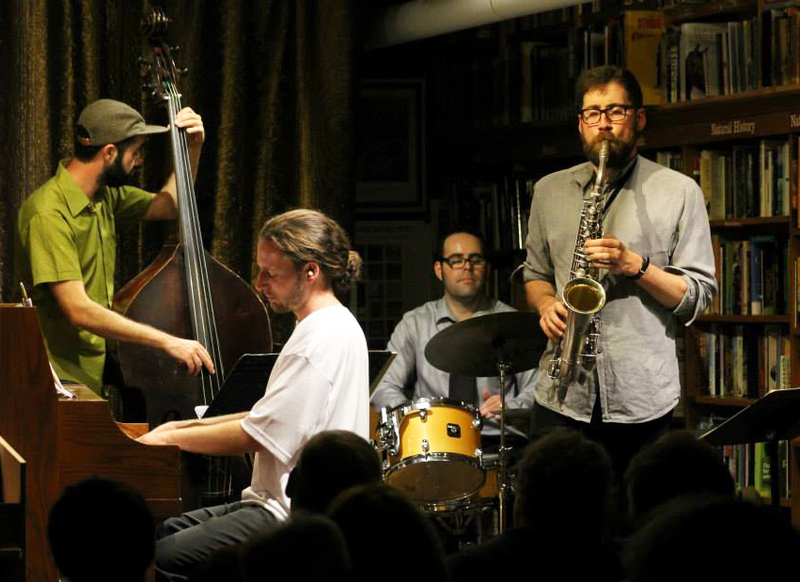 The main focus, Eric says, is "bebop-derived straight-ahead jazz," with the occasional free jazz performer. The bands tend to be local, with regular bands playing in rotation. Performers include Jimmy Ryan's Bird & Beckett Bebop Band, the Ways & Means Quintet, and the Scott Foster Group. It's a listening crowd, Eric says, with fans who really love the music. "The audience is pretty focused on the music here. It's intimate, the acoustics are terrific both for the musicians and the audience. It's just up close and personal." "We have some pretty high-level musicians who stop in," he adds. On Sunday afternoon, he says, the focus is broader. This is when a rockabilly, or surf-a-billy act might appear, or something Middle Eastern or North Indian, traditional music, often acoustic music. 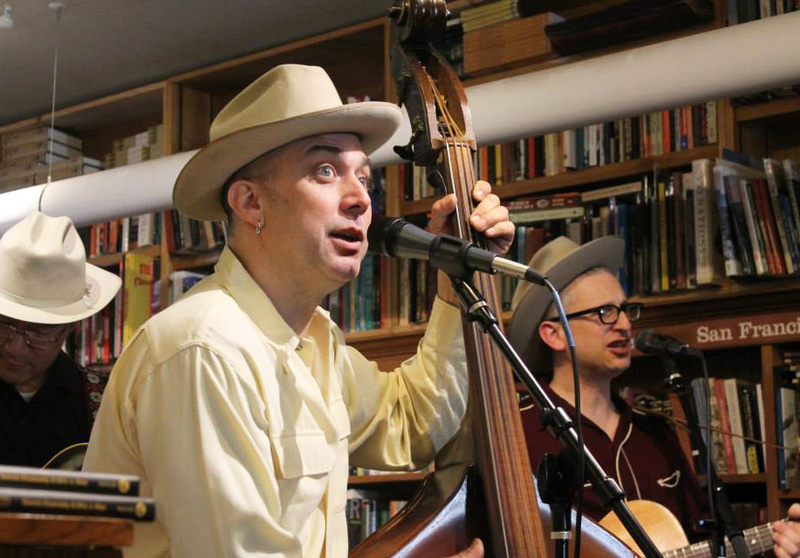 One featured event is the Surf-a-Billy Swing Dance Party, featuring a variety of rockabilly and surf-influenced bands. Eric and associates set out 35 chairs, and up to 50 people attend. So far, he says, no one's been turned away. Do people dance? "Yeah," Eric says, "sometimes we try to get them doing that—usually on Sunday." For more on the live music at Bird & Beckett, click here.